Property Size 1,170 sq. 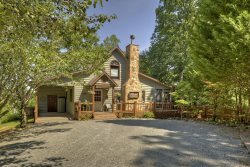 ft.
Mountain Retreat is a quaint 2 bedroom, 2 bath cabin and is perfect for a small family or a couple. The living room features a large cast iron wood stove in lieu of a fire place. Each bedroom along with the living room has a flat screen tv and all have their own satellite connection. For outdoor time, there is a hot tub on the screened porch, a large deck with plenty of seating area and a seasonal view. For a quiet, peaceful vacation, check out Mountain Retreat. Amenities: Hot Tub/Jacuzzi, Dishwasher, Washer, Dryer, Phone, Microwave, Coffee Maker, Satellite TV, DVD, Gas Grill.